When Brad Pitt and Angelina Jolie went about planning their big day, they didn't have to look far to find the perfect wedding planners: their six children. The intimate Aug. 23 ceremony – attended by just 20 friends and family members – was held in the chapel of Château Miraval, the family's estate in the French village of Correns. 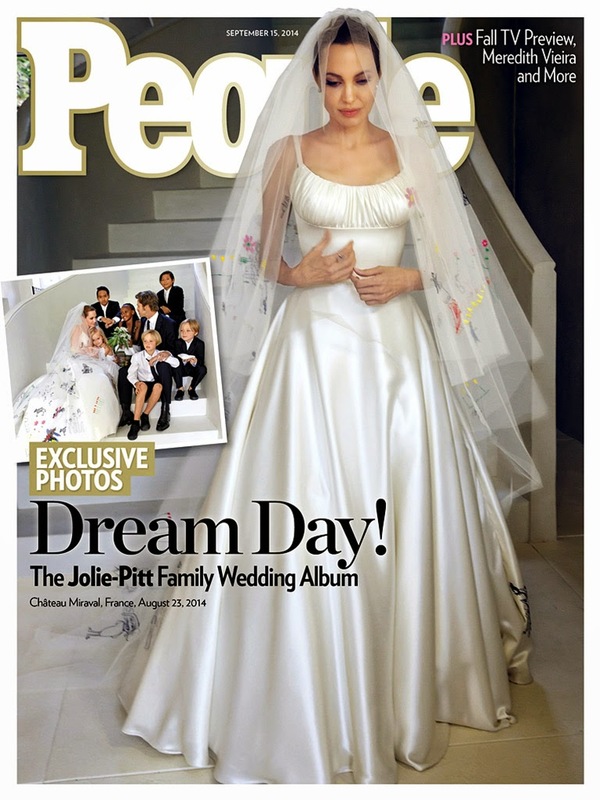 The wedding – including exclusive photos of the ceremony, Jolie's unique dress (decorated with her children's artwork!) and the entire family's celebration – is featured in this week's issue of PEOPLE, in conjunction with Hello! magazine internationally. Each child had a key role to play: Eldest sons Maddox, 13, and Pax, 10, walked their mom down the aisle; flower girls Zahara, 9, and Vivienne, 6, tossed petals gathered from the garden; and Shiloh, 8, and Knox, 6, served as ring bearers. The kids also helped write their parents' vows. And Pax baked the cake! "It was important to us that the day was relaxed and full of laughter," Pitt, 50, and Jolie, 39, tell PEOPLE. "It was such a special day to share with our children and a very happy time for our family." Even Jolie's dress was an expression of her kids' creativity: Luigi Massi, the master tailor at Atelier Versace, sewed dozens of designs from her children's drawings into the dress and veil. "Luigi is like family to me and I couldn't imagine anyone else making this dress," says Jolie. "He knows and cares for the children and it was great fun putting it together." Pitt wore a suit from his closet – with a tie borrowed from one of his sons because Pitt forgot to pack his. Zahara's dress was designed by family friend Adama Kebe. Maddox, Pax, Shiloh, and Knox wore black suits (Shiloh's included shorts and a top hat), and Vivienne wore a white dress from her closet. Jeweler Robert Procop, who designed Jolie's engagement ring, created the couple's wedding bands. For Brad and Angelina's complete wedding album, all the details of their big day and more of the couple's interview, pick up this week's issue of PEOPLE, on newsstands Wednesday.